"A Ducati for under two grand? 'Spect that's true." "What are they then? Ex-police bikes with hardly any miles on the clock? I suppose they've only been round the once." 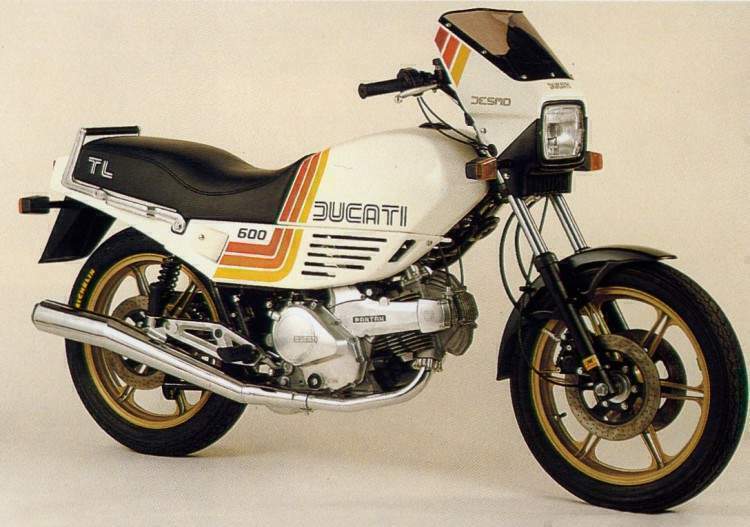 These were just a few of the skeptical comments tossed my way by friends and associates on hearing the news that Moto Vecchia, the Sarf London Italian bike emporium is telling Ducati 6000TLs for silly money. 600TL? I hear you ask. Wait one moment and I shall explain all. 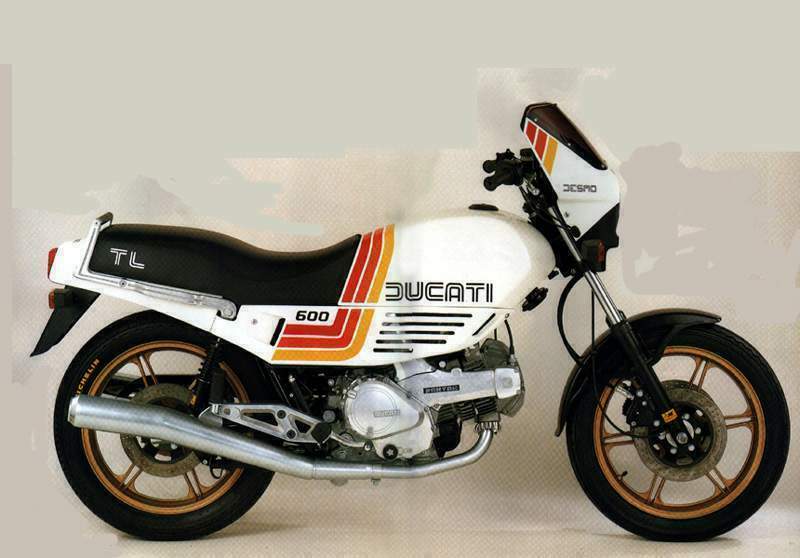 When Ducati bored out the Pantah to 600cc in 1982, several different styles of machine were produced, varying from a police version which the Bologna carabinieri adopted, through an economy model without a fairing, to a touring machine with one-piece bars and a handlebar fairing, otherwise known as the TL. 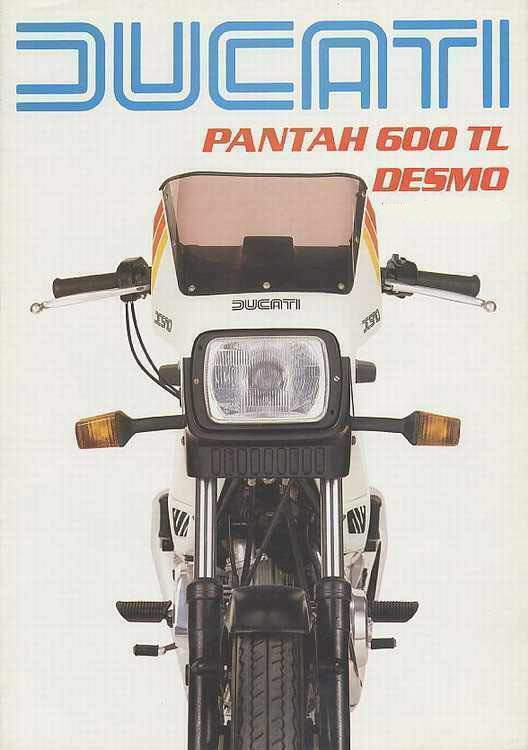 The TL really sold only on the home market because, with production costs almost identical to the SL, Ducatis abroad preferred its sportier brother. Even in Italy sales weren't that good, so when Ducati sold out to Cagiva, a large batch of TLs was included in the deal. At least this was the rumour Richard Avant and Simon Phensic (copyright R Avant/J Ryder), Vecchia's proprietors heard. So, on a lightning trip around the flesh-pots of Bologna and the Cagiva factory, Richard casually enquired after the TLs. Much to their surprise they actually existed and, yes, they could have some for x million lira each. A couple of minutes' feverish prodding of calculators gave them the answer they were looking for: Ducatis for £1995. Palms were slapped, a bottle of chianti was cracked open, and Moto Vecchia joined the ranks of the importers. The first batch was brought in at the beginning of August about ten days ago as I write this copy. And anyone who puts down a deposit during August will get a TL for £1995. Trouble is, due to the vagaries of monthly magazine publishing, you the humble reader won't get to read this autistic prose until mid-September, by which time the price will have risen to about £2200. Still, it's a good deal even at that price. With basically identical construction, the most obvious difference between the SL and the TL is the styling or, in the TL's case, the lack of it. Whereas the SL has a certain angular charm with the fairing complementing the tank/seat unit rather well, the TL looks hideous. Only total Duke freaks and eclectic weirdos (to a certain extent, one and the same) could find any beauty in the styling. I think it's the elephantine side panels which really repulse me. They also hide Taglioni's masterpiece, the Pantah engine. When Taglioni designed the Pantah he adhered to the principle of the V-twin and managed to produce a compact, powerful engine; compact because of the short, 58mm stroke, with width kept to a minimum due to the belt camshaft drive. The bigger vees use "a bevel gear system to drive the desmo valve* which is bulky as well as complicated. The Pantah has two Uniroyal PowerGrip toothed-rubber belts driven from two pulleys sited on the extreme right of a cross shaft located in the crotch of the vee which, in turn, is driven off a helical gear keyed to the crankshaft. Powerful, both because of the 60degree valve angle which has been a feature of racing Dukes since Imola in 1973, and, more importantly, because of the desmodromic valve system. By using cam lobes and lockers to close as well as open the valves, a sharper opening speed is possible, improving midrange torque, while valve bounce and float are prevented, making sustained high revs, thus greater power, possible. In fact, although red-lined at 9000rpm, the engine is probably safe to 12,000 revs. Apart from detail changes such as different lugs and mounting brackets, the TL frame is identical to the SL. Two pairs of parallel tubes running from the steering head meet a similar pair from the crank case rear behind the rear cylinder. The whole construction is extensively braced, making it light but rigid. Rake and trail are unchanged at 30 degrees and 5.1 inches, as is the wheelbase at just over 57 inches. You'd think that with such similar dimensions, the handling and road holding would be identical. Not so. For starters, the riding positions are totally different. The SL's is a pure racing crouch, with all the rider contact points where you want them to be for precise control at high speed. This is fine for arcing through a series of bends but a real drag in town, where your wrists soon start to ache. The TL, on the other hand, has a classic touring position. The handlebars are wide and slightly swept back, while the footrests have been brought forward on alloy hangers: real sit-up-and-beg stuff. Swinging through lines of traffic is the TL's forte, with the rear Brembo giving excellent control, and the clutch, cable-operated now rather than hydraulic, much lighter, though still not up to Japanese standards. What was a problem was the lack of steering lock carried over from the SL. Without clip-ons and a frame-mounted fairing, the TL could easily have coped with 20 degrees more movement. Out on the open road the roles are somewhat reversed. Above 100mph the SL comes into its own. Impeccably stable, it can be aimed into corners with scalpel-like precision, the fairing leaving you in a bubble of still air to concentrate on riding fast. The TL, on the other hand, is far more suited to slower work. The steering isn't any quicker than the SL but the wide bars give it a lighter feel and allow you to muscle the bike onto another line through a bend, something almost impossible on the SL. However, you do pay a price for this ability at about 90mph the TL will begin to feel unstable, wobbling slightly due to the handlebar fairing which, incidentally, is surprisingly efficient — and to the position of the bars taking some of the rider's weight off the front end. With the TL billed as a touring bike, Ducati had even less excuse for the rocky ride than on the SL. The Marzocchis on the rear (most of the future bikes will have Paolis) were firm, as normal, but when combined with an almost non-existent seat they became quite painful. Hopefully the sorbothane (as seen on RG500s) being inserted by Vecchia should cure the problem. Without the rider's weight bearing down on them, the over-sprung and under-damped Paolis at the front would rather shake the bike's head than ride out bumpy corners, which meant that any scratching had to be performed with white knuckles. But scratch it would, with excellent ground clearance, the Brembos hauling you up with customary ease, and the Michelins gripping tenaciously. Sharing the same gearing as the SL, the TL felt remarkably lazy pulling 70mph at only 5000rpm in top, and the first three speeds in gears of 50mph in 1 st, 80mph in 2nd, and 95mph in 3rd, at lOOOrevs, promised great things. But performance tailed off dramatically in the top two gears: 4th was only good for 110mph at 95OOrpm, and any attempt to change up for more speed saw the revs drop off to 7800rpm in top. With the same problem due to high gearing as the SL, the TL accentuates it because of its less efficient aerodynamics, making it a stronger case still for lower gearing. The gearbox itself is a three-dog number which, although more prone to finding false neutrals, especially on downchanges, is more robust than the earlier six-dog version. Ducati is slowly getting its act together as far as ancillaries are concerned, but have some way to go. The paint job was up to the usual Italian standard. Around the fuel filler the petrol had lifted the paint as if it were brake fluid. You needed four keys for the bike, with the seat keyhole virtually inaccessible because of the grab rail, and as for those side panels. However, the switches are easy to use and reliable, the mirrors are excellent, and the instruments are clear and accurate, so all is not lost.